Seward Community Co-op is a 42-year-old natural food cooperative located in Minneapolis, Minnesota. Seward Co-op has 15,000 owners, and it is looked upon as a leader among natural food cooperatives nationwide. Unique to Seward Co-op is its “Ends Statement,” which is similar to an organization’s mission statement. Developed by the board, the Ends Statement states that Seward Co-op will sustain a healthy community that has: equitable economic relationships, positive environmental impacts, and inclusive, socially responsible practices. Because of this powerful Ends Statement, Seward Co-op decided to build a second store in the Bryant-Central neighborhood in South Minneapolis. Unknown to Seward Co-op leadership, however, a group of community residents had formed what they called the Carrot Initiative (CI), the purpose of which was to attract a grocer to the Bryant-Central neighborhood. CI contacted a number of local food cooperatives, as well as national grocery chains, yet none of them were interested in a mixed-income community of color as a site for a new grocery store. But then CI spoke with Seward Co-op. After looking at several spaces together, CI suggested that the store leadership consider the Greater Friendship Missionary Baptist Church as a location. The site seemed to be perfect for building the new location. Due to the enthusiastic response from CI, it was assumed that the community would be excited about this development as well. So, Seward Co-op began the process of acquiring the property and several surrounding parcels of land. A community meeting was scheduled to announce the project. Prior to the announcement, another neighborhood group, At the Roots, emerged. At the Roots felt that the CI members were not true members of the neighborhood and should not be considered representatives of the community. The majority of residents in the Bryant-Central community are African American and Latino. The CI members are primarily white and are considered new arrivals to the community. Thus, the announcement of the new store was met with mixed feelings, including distrust and hostility. Many people felt that the new store was a “done deal” and were concerned that Seward Co-op could not and would not address issues of racial and economic equity. The leadership of Seward Co-op was taken aback by the criticism, feeling like they were the “good guys.” They had walked into the intersection of race and class in a community that had been ignored for decades. But, along with the arrival of hipsters and coffee shops, the new cooperative seemed to signal that gentrification had arrived. It was feared that racial equity would be a challenge, as the majority of those representing the cooperative were white. Seward Co-op had received heavy criticism about everything, from the aggressive building timeline, to the appearance of its operations team and board members, to the cost of the food. The cooperative acknowledged that its employee demographic included just 14% people of color. In order to address the community concerns regarding hiring and jobs, the cooperative had to deliberately tackle its unconscious bias in the hiring process. The leadership began an intense process of gaining cultural competency, and this work led to the development of diversity goals for construction and store hiring. Most food justice projects tend to focus on the consumer end of the food system when dealing with communities of color. Usually, the effort is around making the food more affordable. While this is important, it ignores the true capacity of the community. Most communities are comprised of residents and entrepreneurs who buy food, but who are also skilled and valuable to local emerging food stores. What many non-profit food projects miss is the connection between food access and fair wages. So, Seward Co-op developed multiple access points to address food access concerns. One access point is a program called Nourish. While an ownership share of the cooperative is normally $75, via Nourish, anyone on SNAP, WIC or any other government-assistance program can access ownership for only $15. Additionally, a 10% discount on every purchase is available for those who request it. Another access point is the cooperative’s goal of having 32% non-white employees by 2018. Saying these numbers were soft and inadequate, however, community organizers called for a 70% goal. The new store opened on October 6, 2015. 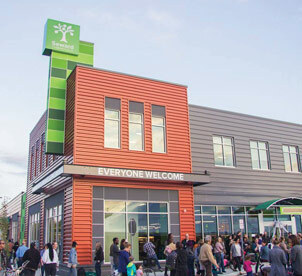 By November 1, over 1,000 new owners had joined at the new location. Seward Co-op also exceeded its 2018 diversity goal ahead of target in 2015 by 3%, and today 61% of the new store’s staff are people of color. Moreover, the owners of the cooperative have confirmed their commitment to racial equity, as five of the nine board members are now people of color, making the cooperative the most diverse one of its scale in the country. While this success is admirable, it should be noted that this kind of equity work in the food movement is the exception and not the rule. Indeed, it should be the goal of every food cooperative to embrace diversity by strategically working on racial and economic equity. The Other Side of Green!